Although we are still early in the data collection phase of the atlas project, we are starting to plan for the long-term presentation of data. Eventually, we will provide information about the birds present in each block via the interactive map that many volunteers used to sign up for a block. Our plan is to provide summary information in the pop-up window that you can view if you click on a given block on the map. Initially, each window provided the block name, the lead volunteer that the block has been assigned to, and links that allow you to download maps of the block. We have just added a feature that will add the number of species with breeding evidence and the number confirmed. 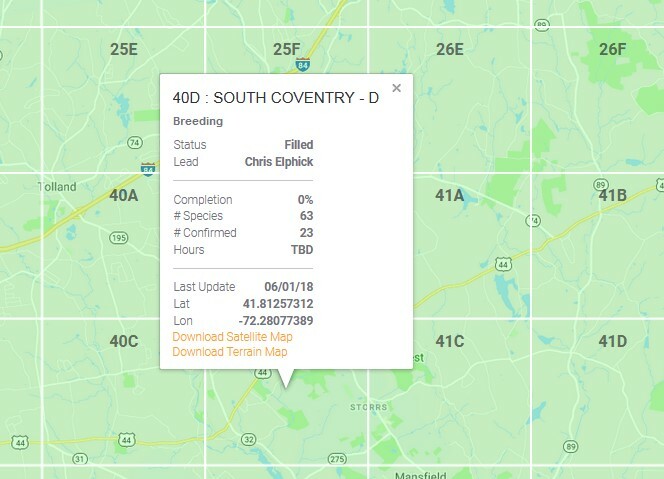 For example, in the screen capture below, you can see that in block 40D – which encompasses most of the UConn campus – some evidence of breeding has been found for 63 species, and 23 species have been confirmed. Users of this feature should know that the numbers are currently based only on eBird submissions, and that they have had only minimal review to check for errors. Non-eBird submissions will be added as we get that data entered into the database. We are also planning a variety of data-checks, which we will apply to the entire data set later in the summer, to ensure that errors do not slip though. So numbers might change. Also, be aware that the numbers on the map do not update in real time – currently we are updating about once a week, which allows us to do a preliminary review of the data. Note too, that we are not yet updating the number of hours spent in a block or the % completion (which is based on the number of hours). This information will come later. Ultimately, we will also include a link that you can click to get a complete list of all the species reported from a block, the highest breeding code obtained for each, and which species were found during the first atlas project in the 1980s. That particular function is not available yet, but will become so later in the summer, so that next year everyone knows exactly what they still need to search for. Previous PostPrevious Drumming, cowbirds, eggshells: what breeding code should you use?